Published in October 2015 (and in the US and Canada in January 2016), this is the biography of a little-known wartime special agent whose exceptional story Steve and I first uncovered in The Children Who Fought Hitler. I was just pleased to be able to tell her story in full for the first time. Though no longer with us, she deserves recognition for the part she played. “This is the true story of a woman whose life was marked, almost from the beginning, by a series of life-changing challenges and adventures. How she coped with them, and at what personal cost, forms the basis for this book. The narrative begins, before her birth, with the horrors of the Great War and traces the influence of a highly unusual childhood among the war cemeteries of Flanders. Still in her teens, she is plunged into the chaos of the 1940 Dunkirk evacuation and emerges into a life of heightened intensity and danger during the London Blitz. 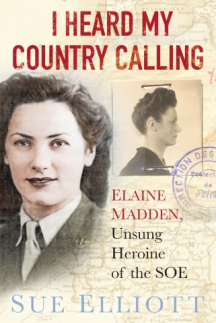 Elaine Madden never claimed to be a heroine but her story proves otherwise. Its centrepiece – war service as one of only two women Special Operations Executive agents parachuted into enemy-occupied Belgium – is just one episode in an extraordinary real-life drama of highs and lows, love, loss and betrayal. Read more about Elaine here on The History Press website. Buy I Heard My Country Calling on Amazon here.